On September 11, 2001, Arab Islamist terrorists hijacked airplanes and crashed them into the twin towers of the World Trade Center in New York City, causing the buildings to collapse. Although almost 3,000 people died on that terrible day, many first responders, recovery workers, and area residents have been getting very sick and even dying because of all of the toxic substances released into the environment. Sadly, quite a few of those once hailed as heroes have found that government agencies were ignoring them. They are the hidden victims of 9/11 and this is their story. 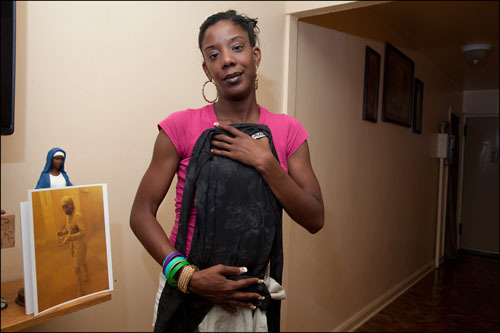 Marcy Borders, a bank employee caught in the collapse of the World Trade Center on 9/11, holds the dress she was wearing when she was covered in the toxic dust as shown in the iconic Stan Honda photograph. Marcy succumbed to stomach cancer in August of 2015. Photographed August 24, 2011, in Bayonne, New Jersey. From The Jersey Journall: Marcy wondered aloud if her cancer was related to 9/11. "I'm saying to myself 'Did this thing ignite cancer cells in me?'" she said. "I definitely believe it because I haven't had any illnesses." "It's now just a matter time - the doctors said there's nothing else they can do. I was 190 pounds on the SWAT Team - now I'm 270 due to the steroids I take. " 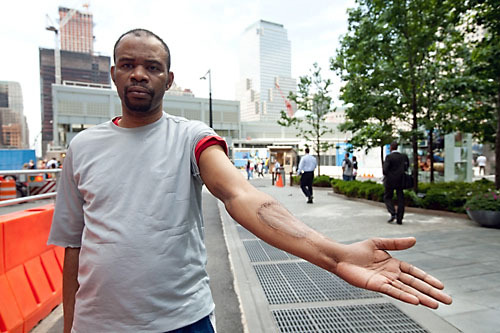 Kenneth George was working for the New York City Highway Department when he responded to Ground Zero on 9/11. As a result of working month after month on the pile, he now suffers from RAD, GERD, PTSD, heart conditions, skin rashes, and must take countless medications and oxygen. North Babylon, NY, February 24, 2011. Click image for a video interview with Ken George. 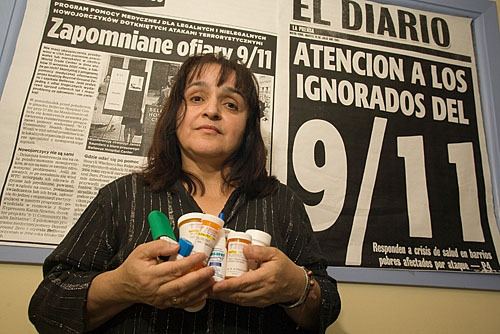 "So this whole 9/11…Sometime I wonder what was better  to be in the buildings and perish quick, or sit and suffer and take all this medication and just wait to die. Because that’s the way my life is going. And I’m only 47 years old. And I’m on all this kind of medication. My whole life is just turned upside down. I know I got one foot in the grave already. That’s a definite." Operating engineer John Devlin worked more than 2000 hours on the Ground Zero cleanup. 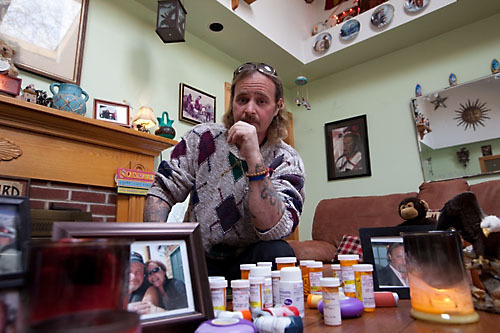 He now suffers from inoperable stage 4 throat cancer, aspiration pneumonia, asthma, and PTSD. Brightwater, NY, March 29, 2011. John passed away on March 11, 2014. "We were breathing all the toxins in the air. We took our death sentence. 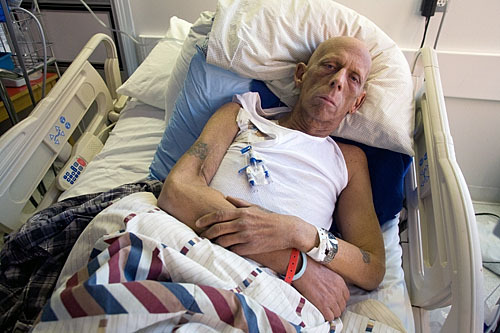 It took eight years for the inoperable throat cancer to appear. I've had 33 radiations, 8 chemos, 5 surgeries, burnt out saliva glands and epiglottis. I lost the ability to eat and drink. if the cancer don’t kill me the aspiration pneumonia will. " John Feal, who lost halh a foot at Ground Zero, became a tireless advocate for 9/11 first responders, recovery workers, and survivors. As Founder and President of the Fealgood Foundation, his leadership was instrumental in passing the James Zadrogo 9/11 Health and Compensation Act in 2010. Nesconset, NY, April 3, 2011. Click image for a video about John. 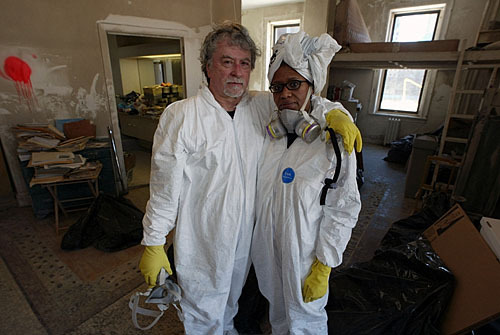 Artist Andy Jurinko with his wife Pat Moore cleaning the WTC debris from their loft opposite Ground Zero, March 28, 2002. 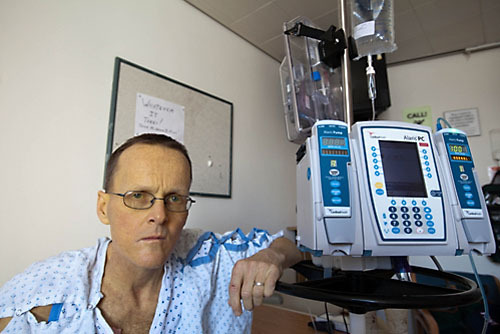 Andy died of pancreatic cancer on February 14t, 2011. Although Andy's father died of liver cancer, Pat does not rule out the possibility that prolonged exposure to 9/11 toxins were a factor in Andy's death. T.J. Gilmartin is a construction worker who drove a tow truck from this scrapyard to Ground Zero where he spent two weeks helping remove fire engines destroyed on 9/11. 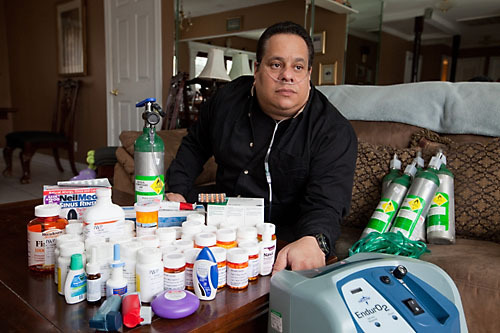 Unable to work since 2008, he suffers from COPD, asthma, GERD, and slepp apnea. Brooklyn, NY, April 14, 2011. "It was like WW III - there was just such mayhem, destruction, body parts. I found half a womans body and a fireman's boot with the foot still in it. My health started bothering me in 2003 and It got worse and in 2008. I couldn’t work high rise construction any more. I was out of breath if I went 3 feet. ’m retired - I’ve got Workers' Comp and SSD. I’m done. So you have a few dollars but you can’t enjoy it. I can’t even walk down the boardwalk by my house anymore. I’d rather have my health back." Retired NYPD Detective Glenn Klein was a highly decorated Emergency Service Unit first responder on 9/11. He suffers from chronic gastro-intestinal disorders and asthma. Glenn is now Director of Police Affairs for the Fealgood Foundation and worked tirelessly to help get the James Zadroga 9/11 Health and Compensation Act passed by Congress. Centereach, NY, February 24, 2011. "All of us were choking at one point - I remember getting our eyes flushed out several times during the day. My eyes looked like they were bleeding. We never really thought about lng term effects. We got respirators but we found out they were the wromg respirators, and an EPA technician told us the air was fine." Former EMS Paramedic Freddie Noboa getting examined by Dr. Wajdy Hailoo at the World Trade Center Medical Monitoring and Treatment Program in Flushing. 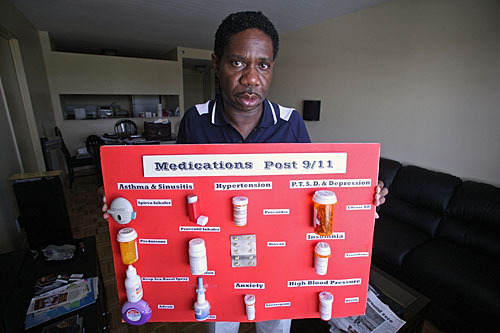 Freddie suffers from asthma, GERD, PTSD, high blood pressure and many other ailments as a result of his toxic exposures at Ground Zero that necessitate his taking 23 different medications. Queens, NY, December 10, 2008. "You could not comprehend the massive destruction. Even though there was an enormous amount of toxic debris and smoke, your skin was on fire you couldn’t breathe, your eyes were tearing, you just kept going on and on. You didn’t care - you just wanted to find somebody. Now my whole life basically transformed from a healthy man to an old man. I loved EMS. It’s all gone now - I’m reduced to nothing"
Jevon Thomas delivered and serviced the portable toilets used by rescue and recovery workers at Ground Zero for over a year. As a result of his toxic exposures, he has developed sarcomas in his hand and arm requiring surgery, chemotherapy, and radiation, as well as nodules in his lungs. Mr. Thomas urges Congress to pass the James Zadroga bill which will provide medical help to ailing first responders, recovery workers, and downtown residents. WTC NYC, 2009. Click image for video interview. Update: Mr. Thomas succumbed to his cancer on April 20, 2011. "I kept the toilets clean at Ground Zero until November 2002, when, all of a sudden, I had a pain in my left hand. It was a sarcoma. They reconstructed my hand, but the next year it came back as another sarcoma in my elbow. I had more surgery and radiation. In 2005 they went into my lungs to remove all the nodules. They discovered I had asthma and another lung disease. I still receive chemotherapy every two weeks." 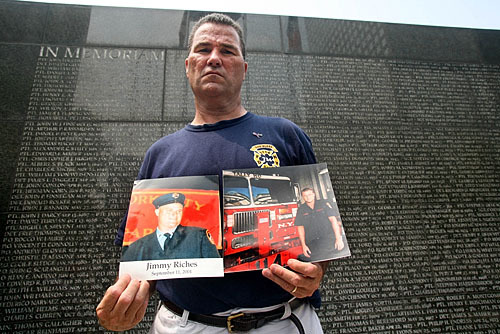 Former FDNY Deputy Chief Jim Riches lost his oldest son, FDNY firefighter Jimmy Riches, on 9/11. 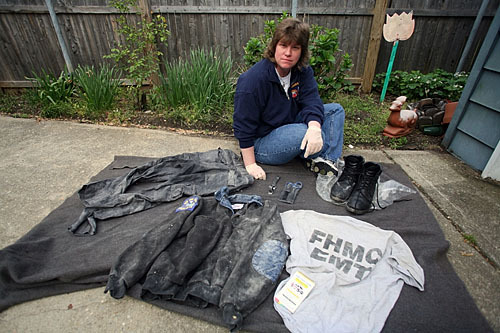 He worked on the pile and found Jimmy's body on March, 25th, 2002. Soon Chief Riches fell ill and wound up in a coma. His lung capacity is reduced by 30% and he had to retire. New York, NY, July 27, 2008. "We found 150 full bodies and 20,000 body parts. It was like being in hell down there - arms, legs, people cut in half - a gruesome job. There were guys down there that were spitting up blood. And now many, many people are sick It’s a sad state of affairs that everybody’s sick now. I always have my inhaler with me. I never know when I’m not gonna get my next breath. 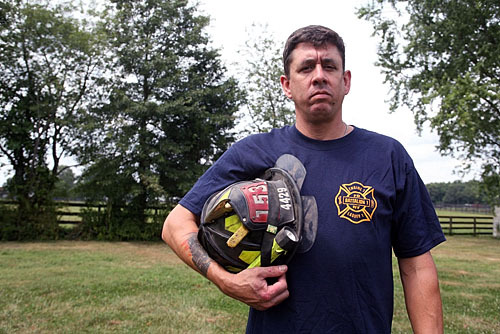 I’m just glad to be alive"
Firefighter John McNamara, at home in Long Island, is fighting colon cancer after 9/11 and Ground Zero toxic exposures. He arrived at Ground Zero on 9/11 and worked there until March 2002. He's had numerous surgeries for cancer and has been in and out of Sloan-Kettering Memorial Hospital. At home in Blue Point, New York, June 17th, 2008. Click image above for more photos. John died of his illness August, 2010. "He cut the bad piece of my liver, out resected my colon, took a piece of my stomach out because the tumor pushed into it, took my lymph nodes and a gall bladder, and installed a pump for my liver. I’ve had radiation, chemotherapy. I have nodules in my lungs now that weren’t there. Biggest one is less than a centimeter. My doctor said it was one of the most aggressive tumors that he’s ever seen in a colon. My oncologist is a firm believer in that what I have is from the Trade Center." 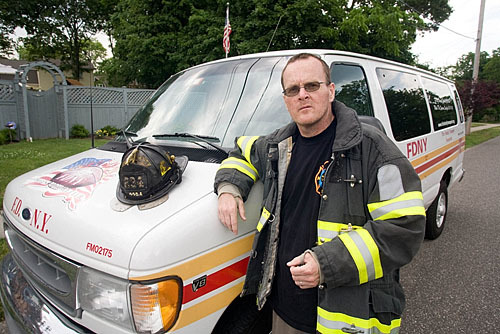 Firefighter John McNamara, suffering from cancer due to 9/11 toxic exposures, in the hospital after an inoperable tumor was found. John's skin and eyes are yellow due to liver function problems. NYC, 2/26/09. John died of his illness August, 2010. 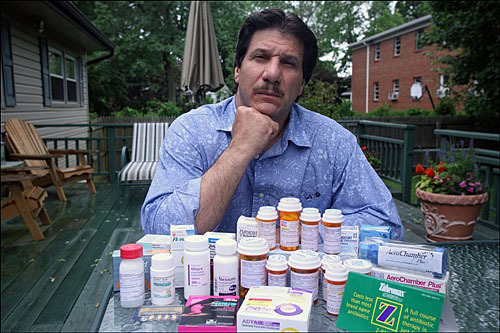 Click the photo to watch the video of John urging passage of the Zadroga 9/11 Health Bill. 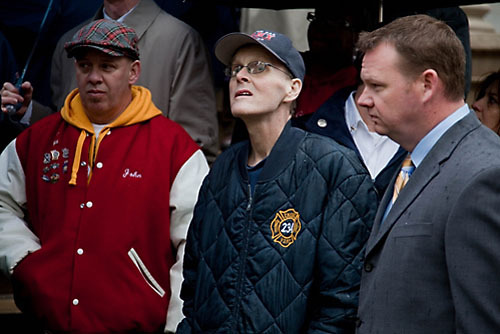 John Feal, John McNamara, and Kenny Specht join an outraged First Responders rally at City Hall to protest Mayor Bloomberg's attempt to have a Federal Judge dismiss all claims of illness and injury sustained by uniformed services personnel as a result of their exposure to toxic materials during the rescue and recovery efforts after the World Trade Center attacks. NYC 3/19/2009. John died of his illness August, 2010. 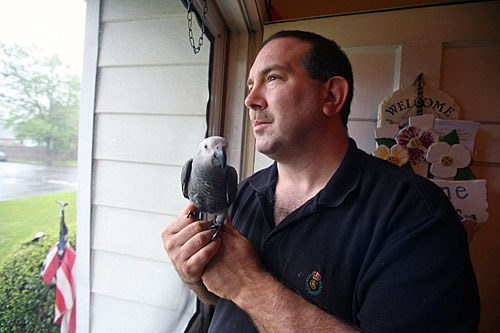 New York State Corrections Officer Greg Quibell, 53, at North Shore University Hospital in Manhasset, April 2, 2007. He worked at Ground Zero from September 12, 2001 until Thanksgiving 2001, and has endured four rounds of chemotherapy to combat leukemia. Greg died on August 27, 2008. "On 9/11 I thought, 'This is World War Three - this is it.' It was like a living hell to walk into that. I got sick to my stomach - some of the body bags looked like spam inside. It was horrible. I cried. I have no regrets of being there. If I recovered 100% from this and it happened again, I'd go right back. That's what I hate about the whole thing - it just stopped my whole life." 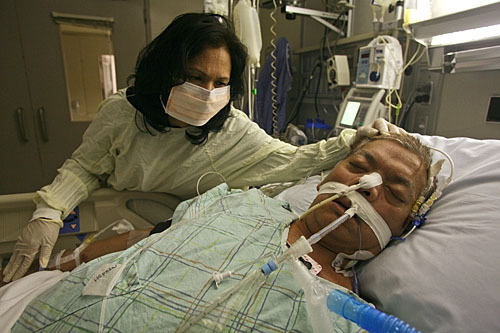 Retired NYPD Officer Cesar Borja, dying from pulmonary fibrosis, is comforted by his wife Eva at Mt. Sinai Hospital, 1/20/2007. He died three days later, before he could get a lung transplant. For more images of Cesar Borja in the hospital, click the photo above. For images of Ceasar Borja Jr. at the 9/11 Health Rally at Ground Zero, please click here. 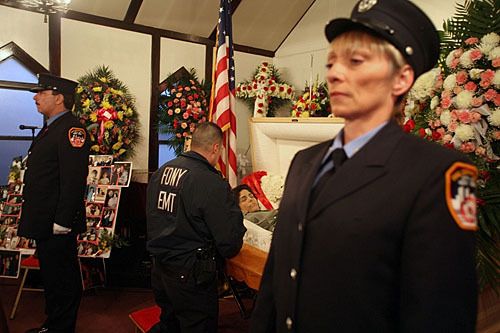 The wake for FDNY Paramedic Deborah Reeve, who died of cancer from working at Ground Zero after 9/11. The Bronx, New York, 3/19/2006. "This wall of black and gray swept over us. A shock wave actually knocked me backwards about 10 feet and I landed on my back. I lost my wind. I was in the middle of a cloud at that point. Everything was black. The unimaginable had just happened." "They've left us in the dust because it's about money. Had they given us treatment from the get-go, a great majority of people would not be dying a painful, painful slow death. We're walking time-bombs - our time is limited. And 9/11 and the exposure to toxins and not getting treated in time have shortened our lives." "Most of America wants to just forget about 9/11. And you know what America? So help me God I don't blame ya. But just understand - there's people like us out there who can't forget. We can't go on with our lives. Our lives will never be the same. We can't heal, America. There's a lot of who can't get back to where we were." "What people must remember about 9/11 is that the cops, firemen, EMTs, all had very physical jobs. These were healthy people who had these jobs. We had to pass a physical every year. The question now becomes, if all these people were healthy, why are they all sick now? You don't need to be a rocket scientist to figure this out. What is the common denominator? 9/11 - Ground Zero." "9/11 was something we didn't expect. It was an attack on our city. Even though I became ill, because I love being a police officer and a detective, it brought me such joy and happiness and accomplishment, to just help people. If I had to do it again, I would do it again, because that's how our police officers are. That's our job - we had to help the families bring closure, to find a loved one." 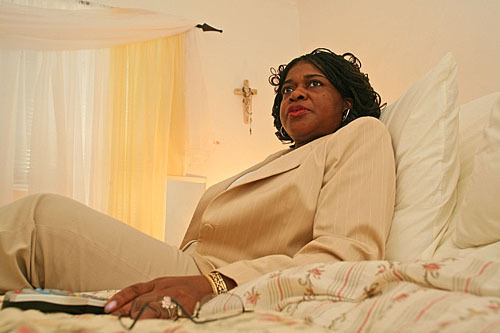 Mercedes Burgos worked as a cleaner after 9/11 in buildings around Ground Zero including the Deutsche Bank Building. She is now homebound except for visits to the doctor. At home in New York, NY, 5/23/2006. "The conditions at 130 Liberty were very bad. I was in the basement. Everything was damaged; there were spoiled food, dead rats, fungus on the walls, contaminated water on the floor. They had me putting papers in a machine and right there I started to feel bad and I couldn't come back to work." 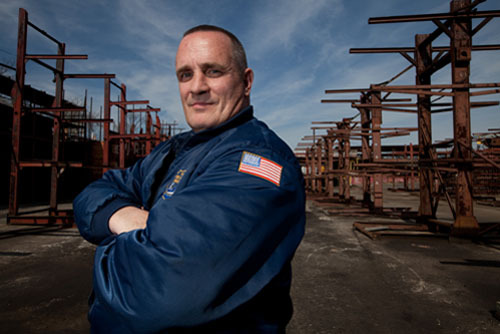 Former Air National Guardsman Mike McCormack lost his original Workers' Comp claim because he volunteered at Ground Zero, where he found the WTC American Flag. After a hearing in Happaugue, NY, 6/9/2006. "I noticed a large swatch of red cloth under a large beam. My immediate thought was that this was a woman victim. We started digging like mad. Soon I realized that it was an American flag that I had found. The flag was identified by the Port Authority as the flag which was flying atop the towers as they were attacked and destroyed." "I'm half the man I used to be - I have to take it slow. A lot of people look at what I'm doing and say that I'm doing fine - they don't see me sucking wind after climbing up and down the ladder. I was a soccer player and a gymnast and used to run long distance - I can't do any of that now. I gotta take rest and take breaks and take my medicine." 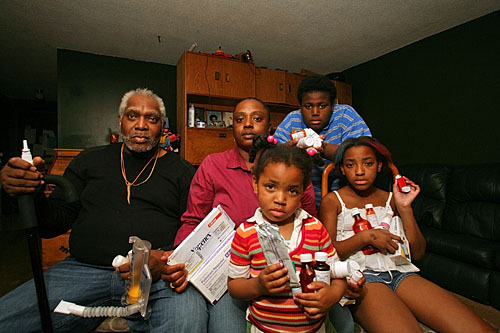 Residents of Lower Manhattan, like Mariama James and her family, have long-term health problems such as asthma from breathing the toxic dust and fumes after 9/11. At home in New York, NY, 6/13/2006. "I think that the attack of 9/11 hasn't seen the last of its victims, not even remotely. There's going to be victims for many years to come, unfortunately. I just hope that the government would decide to look into this and maybe give back the money that they've taken from New York City and start looking into some respiratory health for everyone. Right now there's at least some for adults. There's nothing for children. We all need to be checked." 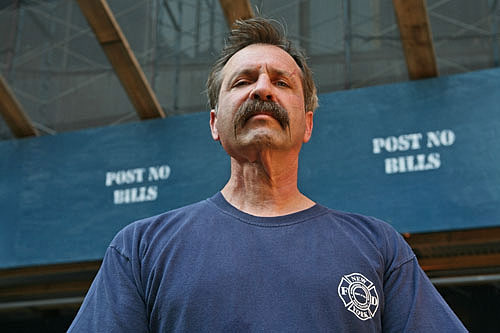 Former FDNY Firefighter Ralph Geidel worked on The Pile for 230 days after 9/11 searching for the remains of his brother, Firefighter Gary Geidel of Rescue 1, who died on 9/11. Ralph, who had a radical neck dissection to remove cancerous lymph nodes and a carcinoma from his tongue, wants the search for remains to continue at the Deutsche Bank Building, shown here behind him, before it is torn down. Ground Zero, July 24, 2006. Ralph died in California on October 21, 2014. "When we first got there it was actually like working inside of a volcano - it was extremely hot. We were digging by hand. There was this orange-yellowish smoke coming out. Our skin was turning maroon. We were hoping to find someone alive but it was just bodies. I knew my brother Gary had a skin graft on his heel. I removed firefighters' socks and boots trying to find him. It was horrible from day one to the very end - it was a nightmare." 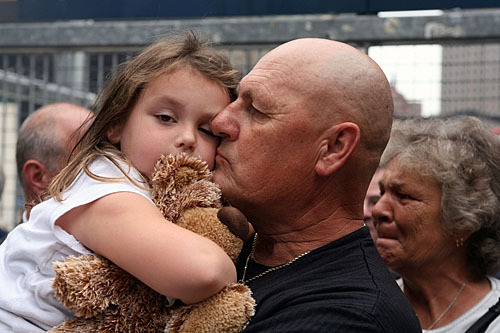 Jospeh Zadroga, father of NYPD Detective James Zadroga whose death was linked directly to 9/11 exposure, holds his son's daughter Tyler Ann at a rally at Ground Zero for responders and recovery workers, as his wife Linda tries to contain her emotions. New York City, 6/17/2006. Former NYC Sanitation boat driver Jack Saltarella was exposed to barge loads of Ground Zero debris at Fresh Kills for 10 months and had to retire. 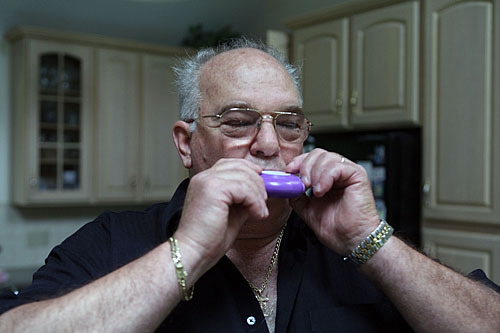 Jack uses an inhaler to breathe at his home in New Paltz, NY, 6/27/2006. "The dust was outstanding - I never smelled or tasted anything like this in my whole life - it was horrible. Orders were given to not hose down debris at the risk of destroying evidence. It got much worse, because now there was no water to hold down some of this dust. It was all over the place - It blew all over. The boats were totally filthy black, us guys were filthy. Our nose, our ears, our hair, everything about us was covered in this dust." "I knew my apartment would be trashed. It was covered with dust and it was hard to breathe. I started feeling that my throat was raw, I started coughing like I had been smoking cigarettes for half my life, and I got a rash on my hands and face. I got excruciating headaches. I felt horrible  walking up and down stairs was painful. I had the dust tested and the results came back with 1.4 to 2.1% asbestos - higher than EPA regulations requiring a cleanup." 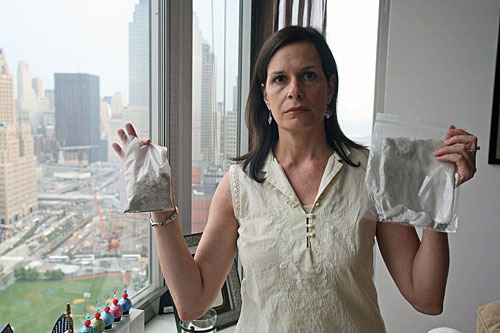 Jenn Duncan, suffering from Multiple Chemical Sensitivity from a workplace accident, found her condition worsening to the point of being completely apartment-bound after exposures to the toxic clouds of 9/11 drifting over Brooklyn. At home in Brooklyn, NY, 8/1/2006. "I have trouble breathing and burning in my nose and throat, migraine-like headaches, severe nausea, burning joint and muscle pain, great difficulty sleeping and eating, and worst of all, my cognitive capabilities are affected. Before, I was a programmer , technical manager, and business person, very active, organized, and productive. Now, I have trouble walking across a room. It's tough to put two thoughts together, to try to remember anything - thinking is physically painful now." 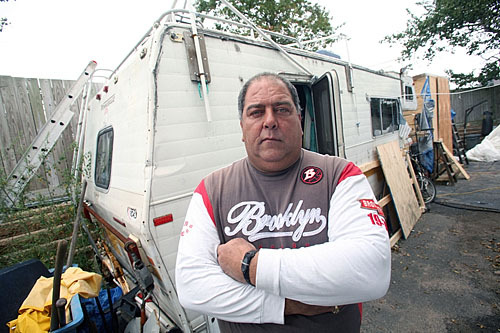 Frank Silecchia, the construction worker who found the steel cross at Ground Zero after the terror attacks of 9/11, in front of the RV in which he lives. Brooklyn, NY, 10/19/2006. "I've tried to go back to work but I've been discharged. 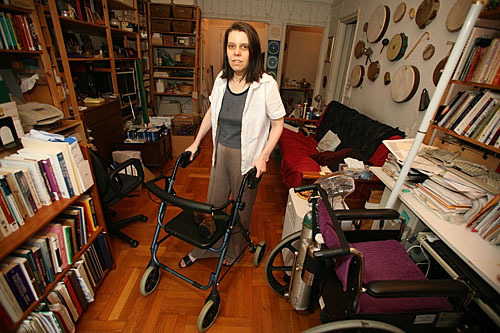 I don't have the stamina any more from this 9/11 stress that I'm going through and the physical disabilities.Financially I am destitute, mentally I am destroyed, and physically I am inept. I'm tired of living in my trailer and of not being able to perform work. I need to exist. Scraping by is not existing." 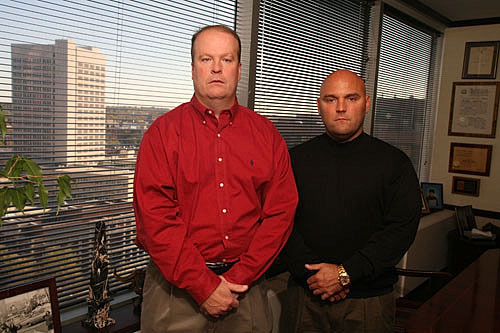 Former NYPD Detectives John Walcott and Rich Volpe in the office of their attorney, David Worby. 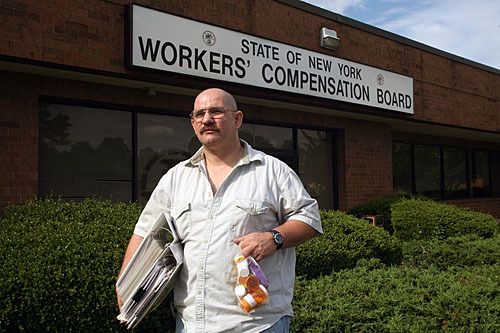 Walcott, battling leukemia, and Volpe, fighting kidney disease, are part of the class action lawsuit against New York City and its contractors, claiming that they failed to protect workers from cancer-causing benzene and other hazardous chemicals. "My doctor said 'You got leukemia, you got a week to live, get to the hospital.' My form of leukemia is a toxin form, not a hereditary cancer - caused by exposure to benzene which is in jet fuel." "My diagnosis was IgA nethropathy. The filters in my kidneys are shutting down. It’s causing high blood pressure, high cholesterol, and high levels of uric acid so I get gout very often which is probably the most painful thing I ever felt in my life." 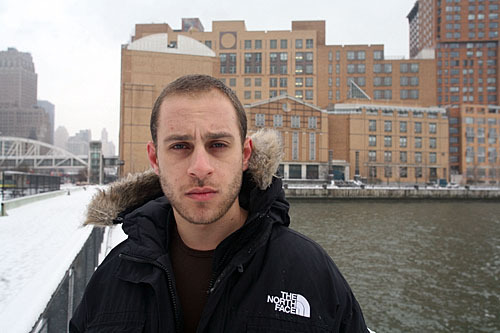 Stuyvesant High School Graduate Amit Friedlander was in class just a few blocks from the World Trade Center on 9/11. He experienced the debris cloud and was in school during the debris transfer operation at Pier 25 next to the school. Amit has battled Hodgkin's Lymphoma, a cancer of the lymph system, and has graduated from college. "Anecdotal evidence of rescue workers at Ground Zero getting similar kinds of cancer made me think that my Hodgkin’s Disease might be related to 9/11. I think getting sick opened my eyes to potential health problems and trying to make sure that everyone who was exposed to all this toxic debris after 9/11 is going to have the means for health screening and treatment for their 9/11-related illnesses." 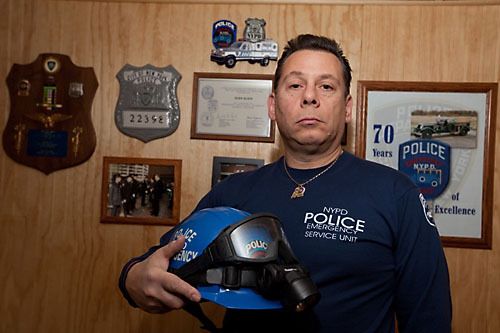 Vito Valenti was a union official who volunteered in the rescue and recovery on September 11 and 12, 2001. 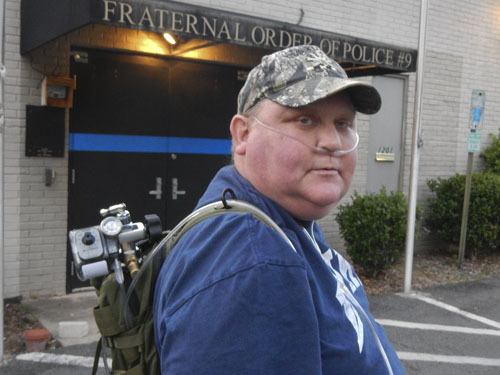 He now suffers from pulmonary fibrosis and is awaiting a double lung transplant. Vito is active in lobbying politicians and works helping others through the Fealgood Foundation. Vito passed away in 2014. "We were in the pile. You could smell death. Everything was burning still. It was like war. It went from a nice sunny day to total devastation. For me it will always be September 111th. I could have chosen to run over that bridge but I wanted to help. I would do it again in a heartbeat. I would go with my oxygen tank." 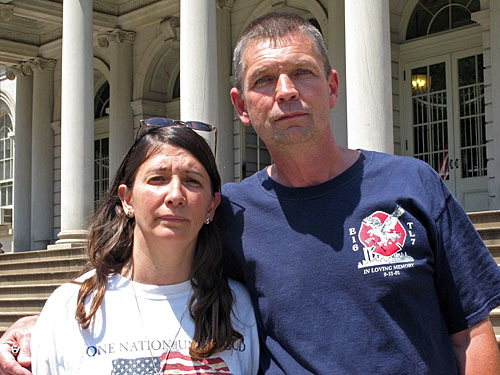 Former EMT Reggie Cervantes and former Volunteer Firefighter William Maher, ill with respiratory problems and PTSD from Ground Zero toxic exposures, in front of City Hall in Manhattan. They went to Cuba with director Michael Moore for his film "Sicko", about the health care system in the United States. 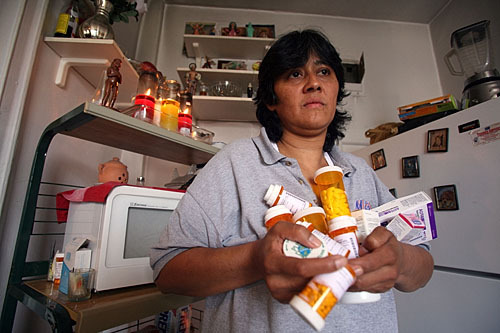 "After 9/11, I was unable to get assistance because I had no income and no insurance. In Cuba, nine specialists treated me and I was given tests and medications which were inaccessible to me in the US. The doctors treated my asthma, bronchitis, COPD, pulmonary fibrosis, sinusitis, rhinitis, vocal cords lumps, enlarged liver, RADS, chronic acid reflux, and PTSD." 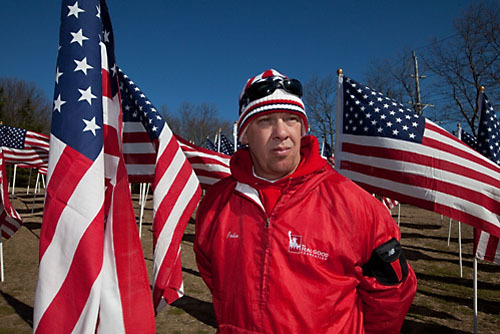 "While volunteering at Ground Zero, I fell off an ATV and worsened a pre-existing spinal injury. None of the specialists in NJ were in my network, so I couldn't get treated. In Cuba, they took a battery of tests and came up with the diagnosis that I needed surgery. They also replaced my teeth which I had ground down due to PTSD." 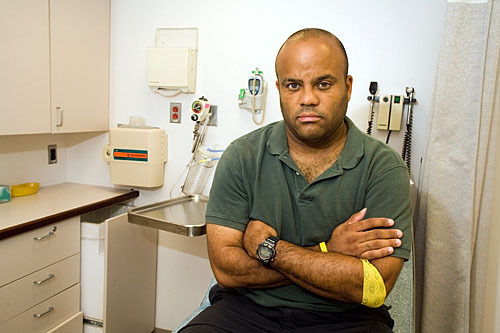 NYPD Officer Reggie Hillaire, here in an examination room at Memorial Sloan-Kettering Cancer Center, has cancer related to post 9/11 toxic exposures. Officer Hillaire had his thyroid removed due to thyroid cancer and now has multiple myeloma. "I just thought that if it was that bad they would have shut us down. No way our government, which just suffered the worst terrorist attack in the country, would open the first responders up to something like that. If it was that bad, they wouldn’t have sent us there. I wasn’t really thinking about the toxins. One of the reasons I kept going was because Christie Todd Whitman said that the air was safe to breathe." Dr. Stephen Levin, Medical Director Mt. 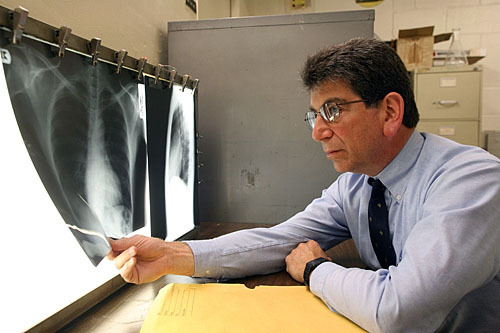 Sinai Center for Occupational and Environmental Medicine, is one of the directors of the WTC Screening and Monitoring Program, which has seen over 16,000 first responders and recovery workers. At Mt. Sinai Hospital, New York, NY, 6/14/2006. "When we heard Christie Todd Whitman get on TV and say that the air quality was safe we were horrified because we already knew that there were people being exposed to high burdens of irritants down there and that people were already suffering respiratory problems, so we knew that it couldn't possibly be safe. It had terrible consequences." 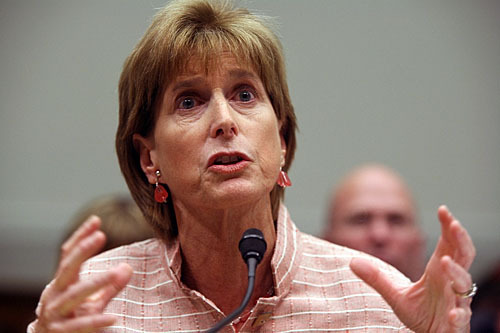 Christie Todd Whitman, the former administrator of the Environmental Protection Agency, testified before Congress June 26, 2007, confronting critics who assert that health risks in Lower Manhattan were deliberately downplayed in the days immediately following the 9/11 attacks. "It's utterly false then for EPA critics to assert that I or others at the agency set about to mislead New Yorkers and rescue workers. Every statement I made was based on what experts, who had a great deal of experience in these things, conveyed to me." 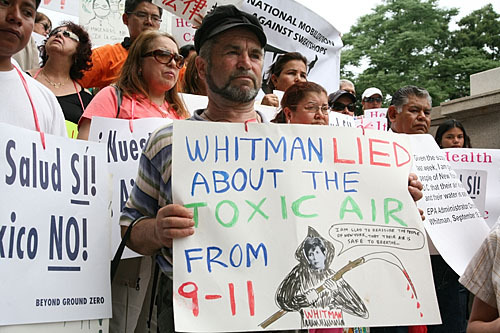 As former EPA administrator Christie Todd Whitman and former OSHA administrator John Henshaw testify before Congressman Jerrold Nadler's first comprehensive hearing on Federal environmental response at the WTC site after 9/11, demonstrators hold a rally outside the building where the hearing was taking place. 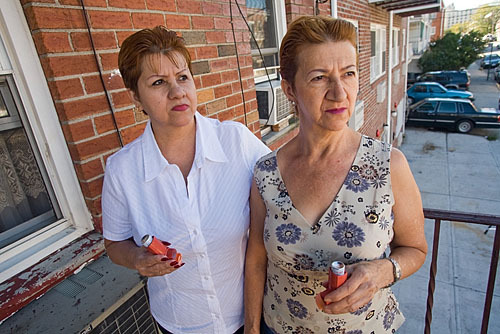 Flor Duque, who did clean-up work in Trinity Church among other locations, and her sister Blanca Neri Duque Castaño, who also worked as a cleaner, have trouble breathing, chronic headaches and stomach pain. Lucelly Gil, a Colombian immigrant, worked 12- and 14-hour shifts for $60 a day, sweeping away heaps of dust by hand in apartments, offices, restaurants and schools, protected by nothing more than a thin paper mask. Six years later, she has asthma, chronic pain in her nose, ears, head and chest, and painfully itchy skin. 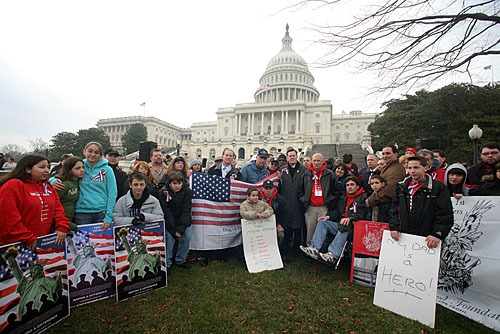 Over one hundred 9/11 Responders and their families rallied at the U.S. Capitol on February 26, 2008 to protest the 77% budget cuts in 9/11 Healthcare funding for fiscal 2009, plus the canceling of plans for the World Trade Center Business Process Center, which would have provided monitoring and treatment for the 10,000-plus Responders who reside outside the New York area. Organized by the Fealgood Foundation and 9/11 Health Now, Congress Members Carolyn Maloney, Jerrold Nadler, and Dennis Kucinich spoke. Click on image above for web photo gallery. 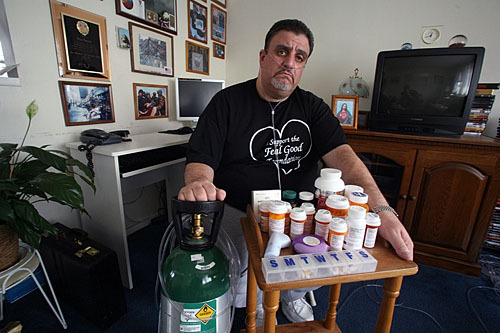 The primary mission of the FealGood Foundation, a non-profit organization, is to spread awareness and educate the public about the catastrophic health effects on 9/11 first responders, as well as to provide assistance to relieve these great heroes of the financial burdens placed on them over the last five years. 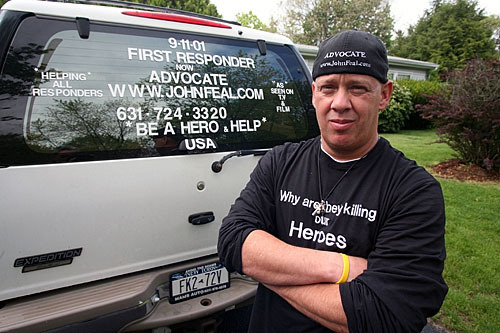 When it comes to helping first responders and recovery workers, John Feal is the real deal. For editorial and broadcast image licensing please contact Polaris Images by clicking the logo below. Click here for information on participating in the Mt. Sinai WTC Medical Monitoring Program. 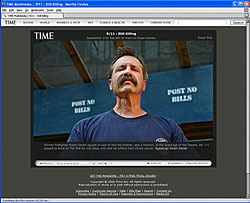 9/11 Health Now provides news and information to the 9/11 Community. The Asbestos and Mesothelioma Center has information and resources relating to toxic exposure to asbestos. If you are a first responder, recovery worker, area resident, or returning worker whose health has been adversely affected by 9/11 and you would like to be photographed and interviewed for this photo story, please click the button below.